Last week my dad took me out for Afternoon tea as a belated Christmas present. I think its fair to say that I do like afternoon tea. 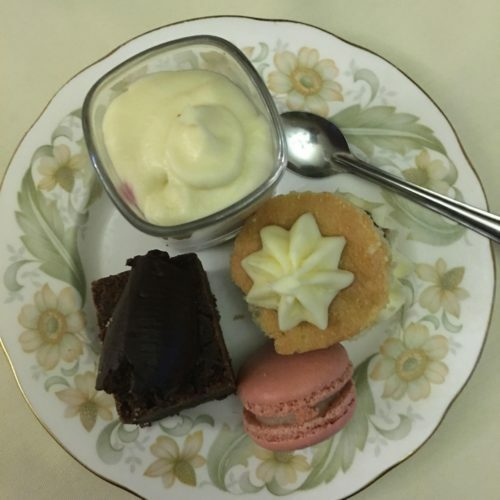 I have been luck to have been out for afternoon tea a number of times and every experience has been enjoyable but the top layer of treats have been varied and so delicious. Its really hard to pick my favourite spread. 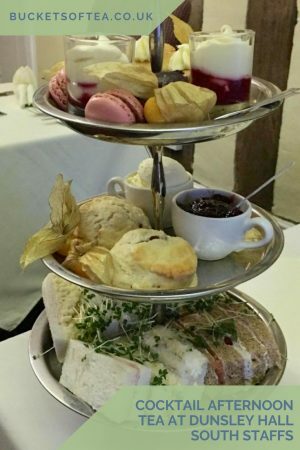 We had afternoon tea at Dunsley Hall hotel which is near Kinver in South Staffordshire. The old manor house which has been converted in to a hotel is stunning both inside and out and has a number of rooms and bars plus a separate smokehouse restaurant. 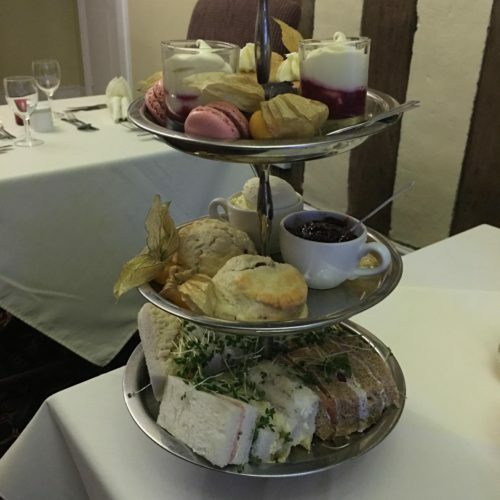 We were seated in a cosy room which looked beautifully classy and couldn’t wait to tuck in to our afternoon tea. When it arrived it all looked so delicious. 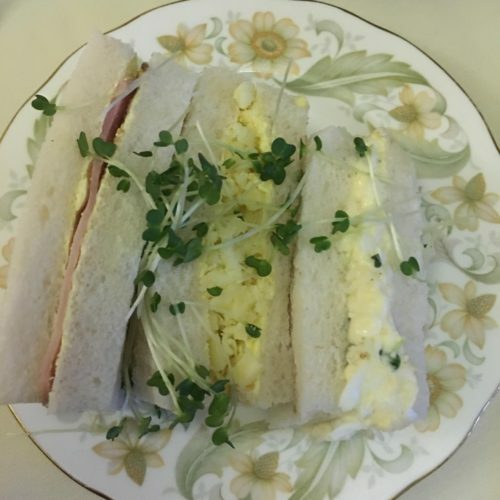 When I read the menu for afternoon tea online there were 6 options for sandwiches. I honestly thought we would get a selection of the six options to share as with all previous afternoon teas we had only had 3 or 4 finger sandwiches. when the tea arrived we both surprised to see we had all six options for each of us. There were 3 white bread and 3 brown bread sandwich fingers each. In the white bread there were ham, cheese and chutney and egg mayonnaise. 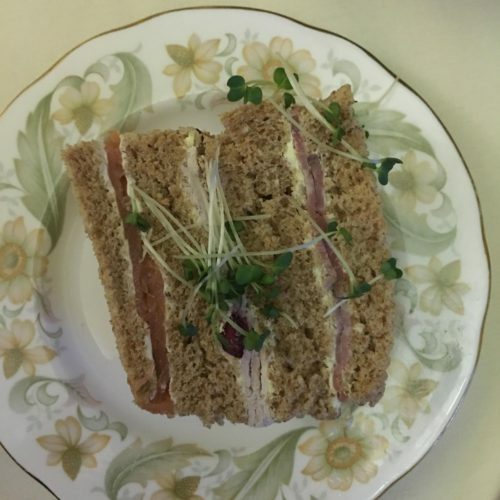 The brown bread sandwiches contained roast beef and horseradish, smoked salmon with cream cheese and roast turkey and cranberry. they were delicious and all other sandwiches had a good layer of filling. 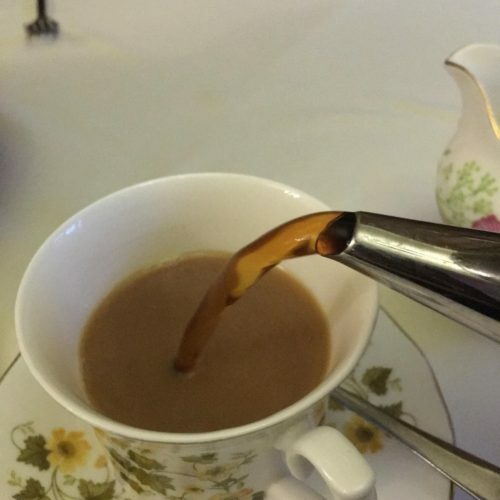 The English Breakfast Tea was lovely and extra refills were offered. My father isn’t a tea drinker and chose to have a pot coffee instead, again this was refillable. After a little breather next up was the warm fruit scone with jam & clotted cream. 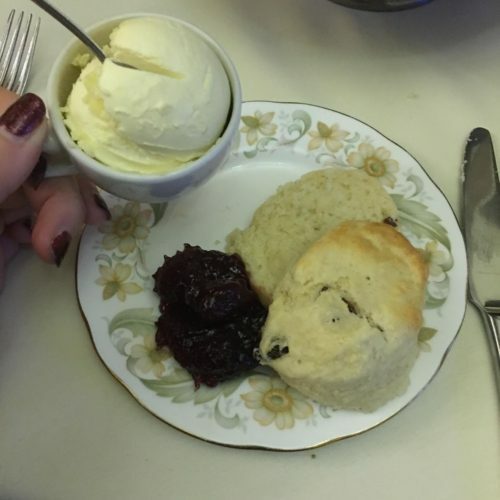 The scone was so light it just melted. This was certainly one of the nicest fruit scones I have tasted. As it was a Christmas treat I picked the cocktail afternoon tea. 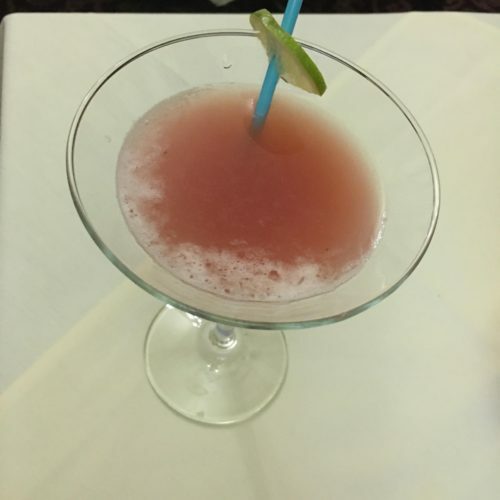 There was a choice of Mojito, Pina Colada, Strawberry Daiquiri or Peach Bellini. I picked the strawberry daiquiri which was just perfect. Finally we tucked in to a selection of sweet deserts. We were served a cheese cake, chocolate brownie, victoria sponge and a macaroon. All really tasty, however I only managed half the chocolate brownie as it really had been a very filling afternoon tea. 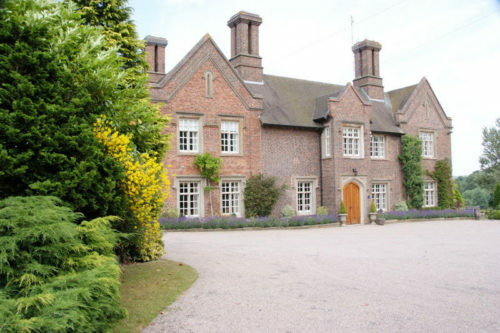 Would I recommend Dunsley Hall for afternoon tea? Without a doubt yes. we ate at 4pm not having eaten lunch and it really was surprisingly filling. 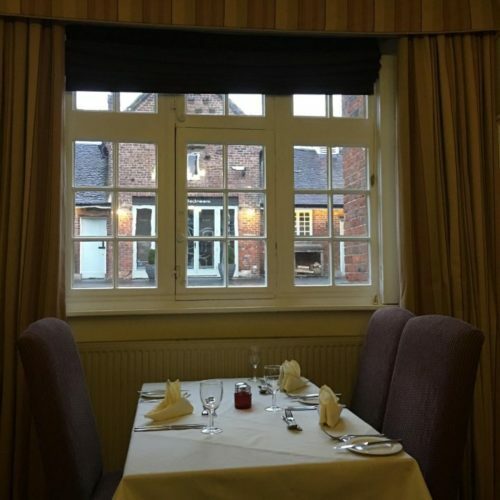 Having taken a look at the menu for the smokehouse I can certainly see us returning to Dunsley Hall for both afternoon tea and also lunch or dinner in the smokehouse. We thoroughly enjoyed ourselves and the afternoon tea was certainly value for money. All I have to do now is find another eleven revues for afternoon tea so I can reach my 2017 goal of eating afternoon tea at a different place each month. This really does look so delicious! I wish I lived nearer as I would certainly add this to my must visit places. How lovely! Classic mummy and daughter stuff for us! That looks amazing. It’s been years since I did a proper afternoon tea and I think it might be time to do it again. You cannot beat a good afternoon tea. This looks absolutely delcious. I always surprised how filling they are too! Oh that looks like a lovely place to visit. This looks amazing! Definitely on my bucket list. OMG im obsessed! I need to totally put this on my bucket list, looks so lovely! You’ve motivated me to search out Afternoon Teas in NYC. I’ve been to London once on a short business trip and now so regret not having extended to enjoy and experience what I perceive as the quintessential English lifestyle I’ve only read about and seen on TV and in movies. 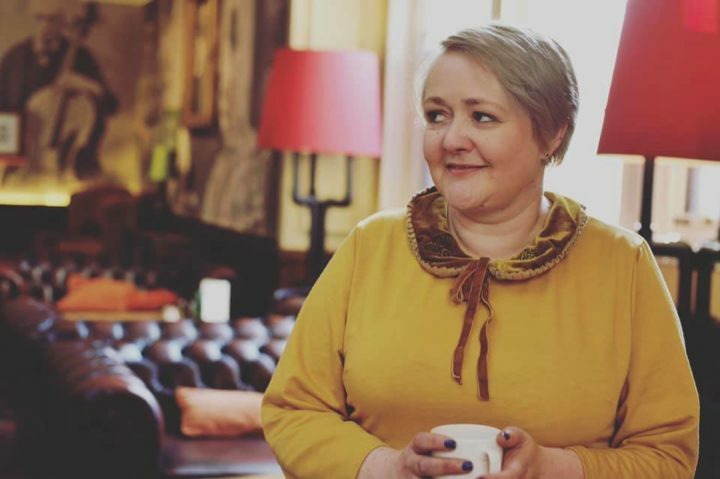 I’ve only just started following you on Instagram and I’m enjoying your blog very much. Looking forward to future tea reviews. Love the UK and it’s grand hertiage homes. Not forgetting a cuppa and a scone, Lovely post! This includes all my favourite words – manor, clotted cream, cheesecaje, cocktails. …I could go on! Ooh. That looks great. Cocktails and afternoon tea is right up my street.